MaxiAids | Are smart phones and other devices causing eye damage? Are smart phones and other devices causing eye damage? Let's face it... we are all glued to our cell phones and other computer devices on a daily basis. Eye muscles get very fatigued from the constant day-to-day use of these tech products. The average adult in the United States, according to a Nielson Company audience report, spends over eight hours or more a day on a device. 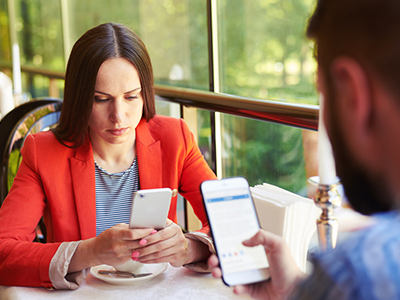 For people who stare at a screen for long periods of time can experience symptoms of blurred vision, trouble focusing, tired red eyes, dry eyes, headaches and more. 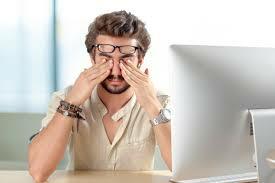 By taking twenty minute breaks away from your computer, remembering to blink when concentrating, do periodic eye exercises, look away from your device and gaze towards distant objects in a room, and use products that filter out blue light and computer glare which can help with eye fatigue and other eye symptoms. Also it's a good idea to wear anti-reflective and glare reducing eye glasses. Magnification products are helpful too. 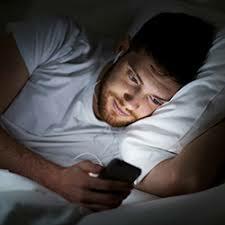 There are eye doctors that are concerned the exposure to blue light may eventually have a damaging effect on our eyes from the over use of electronic devices. The blue light that emits from our cell phones is not filtered by our cornea or pupils. The blue light goes direct to our retinas, where damage may occur. Although there isn't enough evidence to back up how much damage the blue light emits, it still creates eye strain. Some experts believe the damage to the retina can lead to macular degeneration (central vision damage). MaxiAids features many eyeglass products, magnification products and anti-glare products to help ease eye strain and make for more efficient viewing of your tech products. Let us help aid you with the use of eye protective technology in today's modern tech world.